One group of condo owners were forced to deal with their failing condo corporation. After years of neglect the reserve fund was fully depleted. 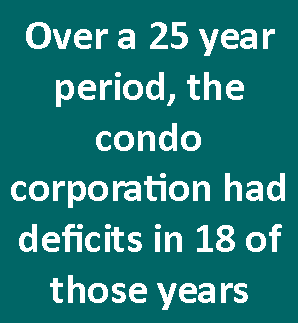 Over a 25 year period, the condo corporation had deficits in 18 of those years. The problem could no longer be ignored when power was turned off for the building because bills had not been paid for months. The condo corporation was out of money. For years condo owners were satisfied with board assurances that all was ok. They were thrilled that condo fees had not increased in more than ten years. Those board members had recently resigned and moved out. A turnaround specialist is focused on corporate renewal. They are skilled at analysis, planning and implementation. They use these skills to save troubled companies and return them to solvency. They identify the reasons for failing performance and rectify them. Private corporations recognize that skills required for ongoing management differ from skills needed to change a failing organization. Struggling or failing condo corporations can implement a successful turnaround by adopting a similar approach. The new condo board brought in professional management with the necessary skills. They stopped allowing owners to be delinquent in paying condo fees. They increased condo fees by 40%, collected outstanding fees and balanced the budget. Property values began to increase and there is no longer a fear of the lights being turned off. It is possible for struggling or failing condo corporations to stabilize and improve. The board requires pragmatic individuals prepared to make difficult choices to put the condo corporation on a sustainable path.